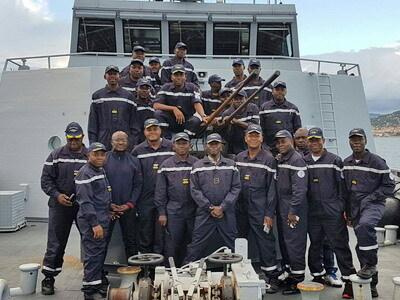 Cameroon’s Navy has taken delivery of the second hand patrol boat CNS Dipikar, which recently arrived at the Douala naval base. CNS Dipikar (P107) arrived in the last week of February, according to IHS Jane’s Defence Weekly quoting a Cameroonian military source. It joins the 212th Combat Division of the 21st Combat Flotilla. The vessel was lifted aboard the cargo ship Happy Diamond, operated by the Big Lift shipping company, on 3 February, according to Mer et Marine. The ex-French patrol vessel (formerly the Grebe) completed sea trials in the Mediterranean in November and December last year. The Grebe was retired by France in 2010 and acquired by Cameroon. French company Sofema was tasked with refurbishing the vessel and delivering it to Cameroon. However, things did not go smoothly – in 2012 while being repaired in Bizerte, Tunisia, the vessel was delayed due to the turmoil caused by the Arab Spring and technical problems. Damage to its propulsion system in rough seas meant further work was needed. In November 2014 the vessel left Tunisia for southeastern France for further refurbishment work, which was carried out by IMS Shipyard. Due to unfavourable sea conditions at this time of year, the Dipikar was sent to Douala by cargo ship. The Dipikar is 52 metres long, 9.8 metres wide and displaces 400 tons. It was built with a steel hull and aluminium superstructure. Crew complement is 20. The vessel can travel 4 500 miles and reach a speed of 18 knots, being powered by two SACM-RVR UD33V12 diesel engines delivering 4 800 hp. It features a command and control system provided by Nexeya, electro-optical and other sensors, a dual 20 mm cannon, machineguns and a new 7.5 metre Sillinger rigid-hulled inflatable boat (RHIB). This can be deployed from the back of the vessel. Cameroon has strengthened its navy in recent times with additional vessels. Over the last five years this includes two P-108 patrol craft delivered from China’s Poly Technologies in 2014, a second hand OPV-54 patrol craft from France in 2014, a 23 metre Aresa 2300 landing craft and two 24 metre Aresa 2400 CPV Defender patrol boats in 2013. According to the Stockholm International Peace Research Institute, two Aresa-3200 patrol craft were delivered in 2014. ISS: Could Nigeria’s court ruling ease the conflict in southern Cameroon?